Email. The word has grown synonymous with tedious work and turned into a curse word. Email. It’s a short word, but it carries a heavy weight, doesn’t it? We feel dogged by it, oppressed by it, and rail against the dumb amount of time we spent trapped in our Inbox. The creators of EmailPet liken the tool to an IFTTT for email, allowing you to establish automatic actions that keep your inbox clean and your attention free for more important matters. And you don’t have to work hard creating rules to make your Inbox friendlier, because EmailPet learns how you like emails managed. EmailPet learns addresses (and subject lines) and then automatically files new incoming mails from the same address where they belong. A simple drag’n drop into folders such as “read for later” or “trash” teaches EmailPet where to send similar email. We all receive plenty of emails that we either instantly discard or file away to read for later. The action takes seconds, and these repetitive tasks seem painless enough on the surface. But the interrupted workflow is a brutal productivity killer. 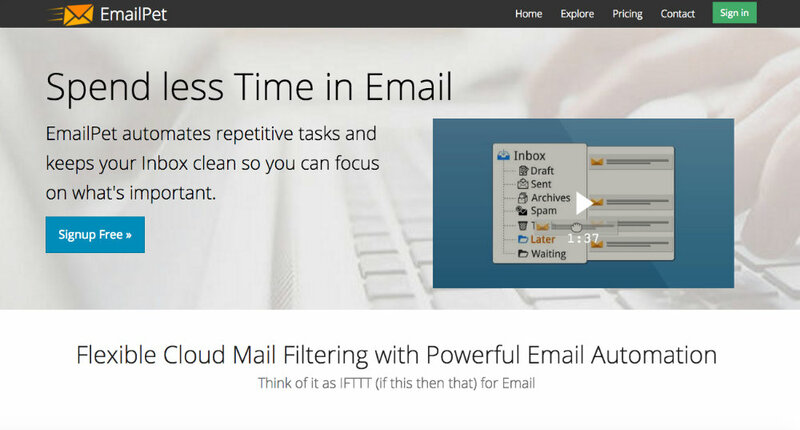 EmailPet filters emails so that you’re not distracted by emails that don’t require your immediate attention – filtering by addresses, subjects, headers, even text within the body of emails, and attachments. Non-urgent emails quietly filed without disrupting our concentration alone is a huge win. Even better, the filtering and automating powers of EmailPet extend beyond the reach of the Inbox and into folders as well. Drop an email into an Evernote folder and it will send the email to that app with the full data intact, for example. Move an email into a Receipts folder and it will automatically ship to your accounting software. Then, when you receive another receipt from the same service, EmailPet will save you steps and file the email under Receipts and ship it to accounting without you lifting a finger. From pushing alerts to snoozing all mail for later reading, you gain tremendous flexibility and control by enlisting EmailPet as your intelligent assistant. Unlike many tools that focus strictly on Gmail, EmailPet works with any email account. And it’s available on all devices, since filtering is done in the cloud. So EmailPet is always by your side. We’d all like to spend less time in our Inbox. Signup for EmailPet at emailpet.com. Take advantage of the free beta period to stop inconsequential messages from grinding your work to a halt.